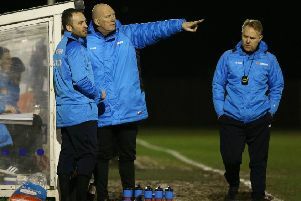 Mark Ward was delighted with his flying start as new AFC Mansfield boss, as a clinical attacking performance saw the struggling Bulls comfortably beat Loughborough Dynamo 3-0 just two weeks after losing to their visitors by the same margin. “I just kept encouraging them and trying to give some self-belief, and if the lads were getting frustrated I tried to calm them down,” Ward said after the victory. 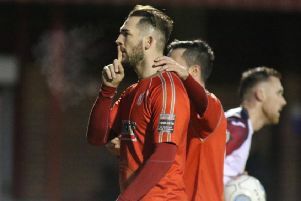 Ward had plenty of praise for hat-trick hero Ollie Fearon, who he believed was back to his old self in a red shirt. “I told him to get back to the Ollie Fearon that Rudy Funk signed from Penistone – just a raw, hungry and happy lad – and to express himself. Fearon fired the Bulls ahead within 20 minutes, with his low 25-yard strike curling into Charlie Taylor’s net. Fearon doubled the hosts’ advantage just two minutes into the second half, with his header from a free-kick just about crossing the line. In quick succession, the striker earned a memorable hat-trick when he headed Charlie Dawes’ cross into the far corner. The win lifts AFC to 16th in the NPL East Division table, with a huge game at Pickering Town up next on Tuesday night.